Welcome to the CTMH Product Spotlight Blog Hop for August! The blog hop makes a circle so if you are starting here just continue until you make your way back and you will have made it through them all. If you have already started and are coming from Elizabeth Mindemann's blog, "Broken Treasures", then you are on the right track. This month's product focus is Circle Cards. Close To My Heart carries ready-made circle cards, including some beautiful scallop-edged clear cards. 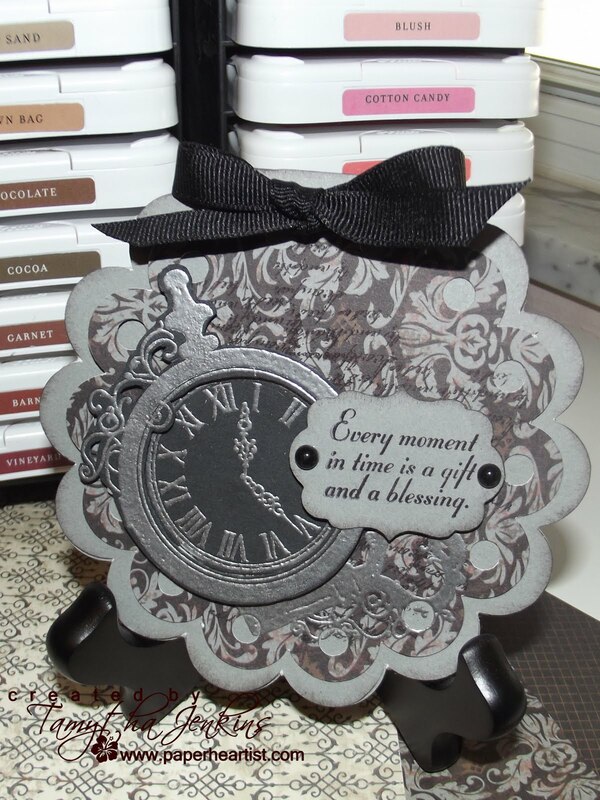 However, as I've mentioned in some previous posts, I am addicted to my Cricut, so I created my circle card using the new CTMH exclusive Art Philosophy Cricut Cartridge...I know...again. :) By the way, I just want to mention. The pattern paper that I used...Mischief. If you take a look at the paper pack, it's obviously a Halloween themed pack. However, I think this card just goes to show you the versatility of the paper pack. I created the scalloped layer and sentiment label with my Cricut. The images are stamped with VersaMark and embossed with Silver. The text on the pattern paper is from the small text stamp in the stamp set. I just love text stamps. Here's a look at the complete stamp set. Isn't it just lovely? If you have time, take a moment or two to check out the rest of my blog. If you enjoy your visit, then please consider "Following Me" and/or leave a comment (we all love comments...the nice ones anyway), then be sure to continue along on the hop by heading over to Nikka Geers' blog, "Create Your Vision" to see her creation. LOVE IT! It looks So aged. The stamps just go great with the scallops and embossing. Nice! 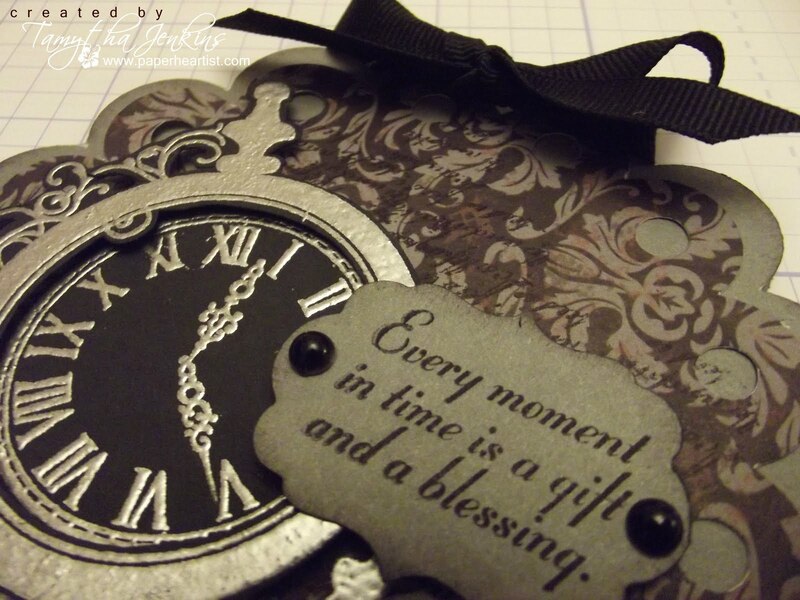 I love the embossing with this stamp set Tamytha! just got this set, thanks for the inspiration to play with it! Beautiful! 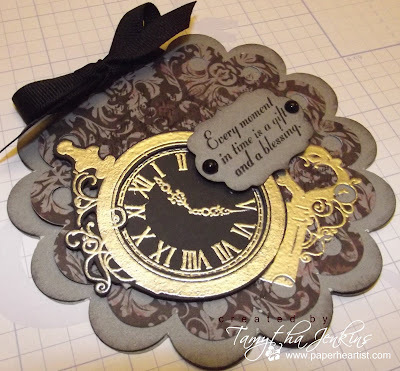 Love how you embossed the pocket watch. Neat card, I love the embossing! WOW! Your card is gorgeous! I love the silver with the Mischief paper.